The Woodson has an enormous collection of images that came from architecture professor Bud Morehead. Some of them were used in his little book called A Walking Tour of Rice University but there are many, many more besides those. Many. They are almost entirely views of the buildings, some from a bit of a distance but mostly close ups of architectural details. However, there is also a more interesting and altogether odder box, which contains strange slides that seem to have come to Morehead by way of William Ward Watkin. They look more like teaching materials than anything else. I was looking at some of those slides today and when I enlarged this one I realized that I had never seen this before. I’m sorry it’s so fuzzy but it’s all I have and you can get a reasonably good look if you click on it a couple of times. (I do suspect that a good search might turn up the original.) It’s all undated but clearly immediately post-WWII. There’s some interesting stuff there but what just jumps out is what’s going on over by the Mech Lab. Is that supposed to be one building? And what could have been the sense of that siting? Might it be this?? Nice parking lot next to the library, though. And that space is still available. I am curious about how many different President’s Houses that Rice U has had. The one shown on this plan is clearly different than the one that existed in the late 1970s, when I was living at Jones College. Together with the newish location across Sunset Blvd., this makes at least three! There are more than that if you include plans that were never built. 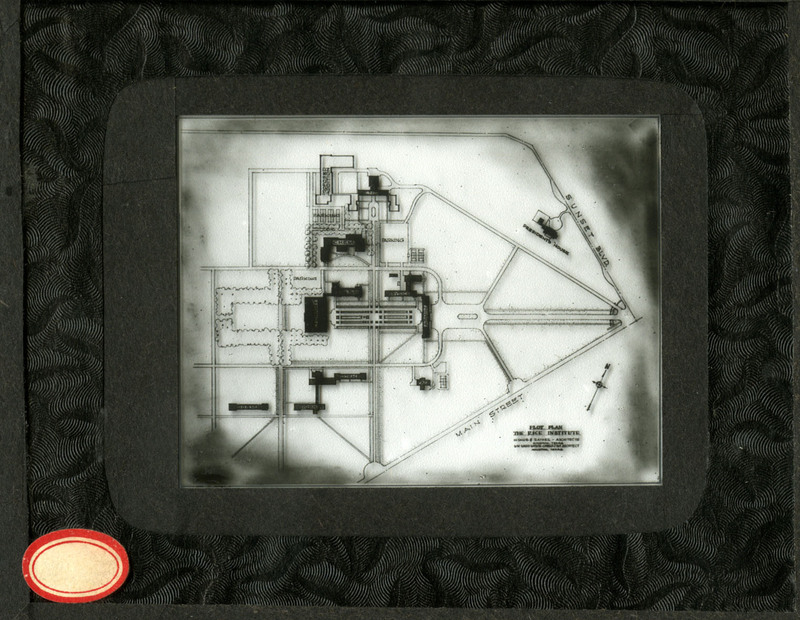 What year was the one shown on this site plan built? Are there any photos available? The one shown on this plan was never built. So where did the president live in the first 40 years or so at Rice University? In an apartment in the Plaza Hotel on Montrose. Staub and Rather did Fondren Library and the President’s House. Did they do Anderson and Rayzor, too? I don’t remember. I’m guessing this is late-40’s. I do not know what is going on by the Mech Lab, but I do notice that the “temporary” buildings housing the Navy ROTC north of the Mechanical Lab are not shown on this sketch. I think they were built during the WWII period as temporary buildings to house the Navy Officer training program, but I think they were in use until the early 1970s. Maybe they are not included because they were expected to be removed soon. The engineering annex is also missing even though it lasted until Ryon Lab was built. I think you’re right–they were planning on tearing these buildings down. The thing that struck me was the pair king lot on the site now occupied by Abercrombie Lab and Duncan Hall. If you think back to the pre-Duncan site, with Bonner Lab and the parking lot, ithe lot always seemed awkward. Now it makes sense; it was the remnant of a much larger lot. Methinks there be an untold story hidden within that comment. Do NOT arouse my curiosity, as I am presently reading the “… final chapter” of the Lizzie Borden saga and may wish to investigate and write a book about “the poker game”. This is, if I can find my glasses.